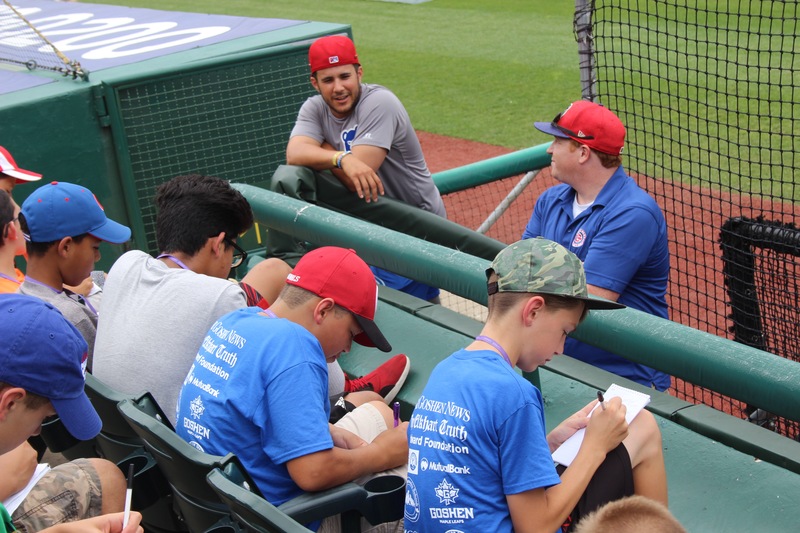 Vimael Machin speaking with campers before the game against Quad Cities. Just before batting practice, Goshen Write on Sports reporters had a chance to speak with Vimael Machin, an infielder for the South Bend Cubs, a Class A minor league team. Machin spoke about his “love for baseball” and “passion for the game” that he started playing before kindergarten. Machin said he and his teammates were “all shocked this morning” when they heard the news that the Chicago Cubs had acquired ace Jose Quintana from the Chicago White Sox for four prospects: outfielder Eloy Jimenez, pitcher Dylan Cease, and infielders Matt Rose and Bryant Flete. “We have to keep focusing on our playing here,” Machin said. And that he did. In the game that followed against Quad Cities, campers watch Machin, who started the game at third base, open with a bunt single in the first and punch a single past the shortstop in the third. He was hitting .320 by the end of the night. Campers also had a good view of a play in which he threw out a batter on a sharp grounder to third (our seats were by third base, in the first rows). The Cubs lost the game, 5-3.